The Mechanism for International Criminal Tribunals (Mechanism) today launched an online exhibition that provides insight into the suffering of children during the Rwandan genocide in 1994 and the conflicts in the former Yugoslavia in the 1990s. 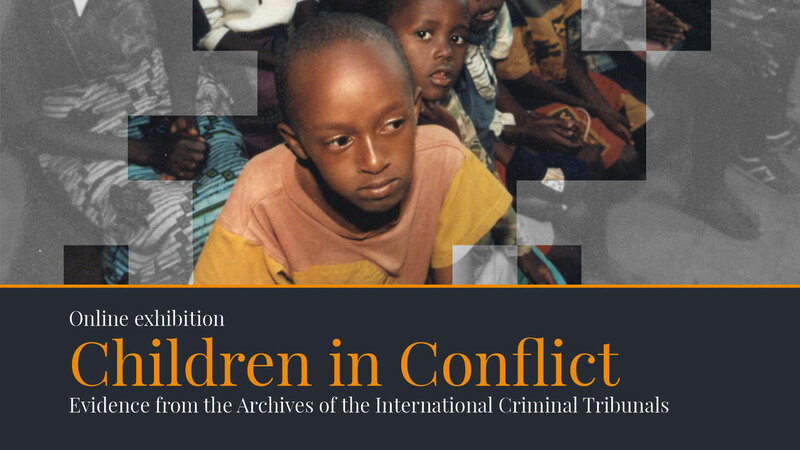 ‘Children in Conflict – Evidence from the International Criminal Tribunals’ illustrates how children became the intentional target of torture, sexual violence, persecution, forcible transfer, murder and extermination during the conflicts in Rwanda and the Balkans. The exhibition draws upon a selection of witness testimonies, photographs and audio-visual materials entered into evidence in cases before the International Criminal Tribunal for Rwanda (ICTR) and the International Criminal Tribunal for the former Yugoslavia (ICTY). In a time when a quarter of the world’s children are affected by conflicts, this exhibition serves as a reminder of the impact armed conflicts can have on a community’s youngest members, as well as of the importance of international courts and tribunals in pursuing accountability for crimes perpetrated against civilians. ‘Children in Conflict – Evidence from the International Criminal Tribunals’ is available in English, French, Bosnian/Croatian/Serbian, and Kinyarwanda. All material displayed in the exhibition is drawn from the archives of the ICTR and the ICTY, for which the Mechanism is responsible.